We're back! Welcome to the world of Morrissey's lyrics. Alcune voci dicono che quest'album sia stato pubblicato, nel febbraio del 1995, per liberare Morrissey dagli obblighi contrattuali dell'epoca. La cover star � Cornelius Carr, un pugile. L'immagine � tratta dal video della canzone "Boxers", girato da James O'Brien. Released in February 1995, this album is rumoured to have been published to rid Morrissey of that time's contractual obligations. 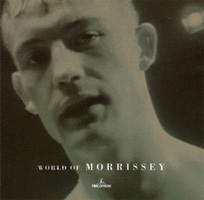 Cover star Cornelius Carr, boxer, taken from the video for the song "Boxers", by James O'Brien.